MINSK, Belarus -- On 29 August, Ales Charkashyn, a member of tactical volunteer group Belarus fighting in Donbas, died from combat wounds. This is the first known death of a Belarusian citizen fighting on the Ukrainian side. No Ukrainian diplomats attended Charkashyn’s funeral in Brest yesterday. Kiev has been reluctant to acknowledge the devotion of Belarusian volunteers fighting for Ukraine by awarding them Ukrainian citizenship and see them as an obstacle in relations with Minsk. The true scale of Belarusian involvement in the Ukrainian conflict remains unknown. Most Belarusians conceal their participation in order to avoid persecution at home. Estimates in the media, such as those given by Belsat TV, range from a few dozen to several hundred volunteers. Several political activists and individuals formerly recognised as prisoners of conscience by Amnesty International have joined the fight in Ukraine. Vasily Parfiankou, who served a prison sentence for participating in protests after the rigged 2010 presidential election, has been serving in Ukraine since last winter. On 25 July, co-chair of the Young Front Eduard Lobau published a video announcement stating that he had arrived in Ukraine "to fight the common enemy”. Arrested for organising protests following the 2010 election, Lobau left Belarusian prison just six months prior to the announcement. The involvement of well-known Belarusian political activists in the Ukrainian conflict who do not conceal their identities draws media attention. Yet according to an anonymous volunteer interviewed by the European Radio for Belarus, the majority of Belarusians fighting for Ukraine have no political background and speak Russian. Many of them have joined the tactical Belarus group, which belongs to Ukrainian militant group Right Sector (Pravy Sektor). On the night of 10 August, the Belarus group came under fire. The Ukrainian coordinator of Belarusian volunteers, Vitaly Tsilizhenko, died right away. Charkashyn, 33, was sent to intensive care with shards in his head, chest and kidney. Ukrainian doctors fought to save his life for two weeks, but he died on 29 August. Since the early 1990s Charkashyn has belonged to the democratic movement in Belarus. He studied at the Tavriyskiy Christian Institute in Ukraine and previously served as the leader of the Belarusian Christian Democracy party in Brest, a city of 310,000. At the beginning of the Ukrainian conflict, Charkashyn assisted with humanitarian aid delivery. Eventually he became a soldier. Charkashyn seemed like a quiet and religious man when the author met him several years ago. Charkashyn is the first Belarusian known to have died fighting on the Ukrainian side; several other Belarusian volunteers died fighting for the separatist cause. Some 150 people attended Charkashyn's funeral on 3 September. The crowd chanted “Heroes don’t die” as his coffin was carried through the streets of Brest. Several leaders of the Belarusian opposition attended, including Paval Seviarynets of the Belarusian Christian Democratic party and former political prisoners Zmicier and Nasta Dashkevich of the officially banned Young Front. The majority of Belarusian volunteers fight in combat groups such as the Right Sector, a Ukrainian far-right organisation frowned upon by the Ukrainian authorities and the international community. A possible reason for this is that only Ukrainian citizens can join the official Ukrainian army. 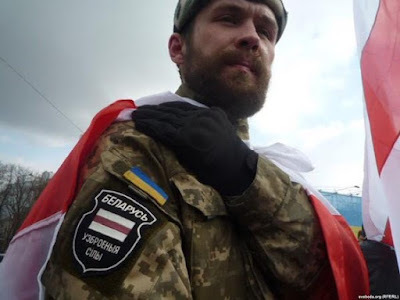 Right Sector, the only pro-Ukraine combat group unaffiliated with the Ukrainian government, may be the only choice for foreigners seeking to support the Ukrainian cause. According to one volunteer, even though all Belarusians who return home from the Ukrainian front are convicted as mercenaries, they do not qualify for refugee status in Ukraine. Were the Ukrainian government to enforce its laws, it could start deporting the volunteers, most of whom stay in Ukraine longer than the laws allow. Even though Ukrainian president Petro Poroshenko and Minister of the Interior Arsen Avakov once promised to award citizenship to Belarusian fighters, most volunteers still have no Ukrainian citizenship. Two Ukrainian parliamentary deputies close to the volunteer corps, Igor Guz and Dmitry Timchuk, proposed a law that would permit granting Ukrainian citizenship to foreign volunteers fighting on the Ukrainian side. The only Belarusian fighter ​who has received citizenship to date, Sergei Korotkich, has a dubious past. Korotkich had lead a neo-fascist organisation in Russia and participated in a crackdown on Belarusian pro-democracy activists in the 1990s. Belarusian volunteers who spoke with Belarus Digest named two reasons for the reluctance of the Ukrainian authorities to grant citizenship to Belarusian volunteers. One reason is the current dysfunctionality of the Ukrainian state. A no less important reason is Ukrainian concern about the ongoing negotiations between Minsk and Kiev. According to volunteer Andrej Strizhak who spoke to Belarus Digest, Ukrainian MPs drafted a law awarding a Hero’s Medal to Belarusian Mikhail Zhiznieuski, shot dead at the Euromaidan protests, but the draft was never voted on in parliament, “perhaps due to a political agreement between Belarus and Ukraine”. Instead of the Hero’s Medal, Poroshenko presented the Order of the Heavenly Hundred Heroes, a lesser award, to Zhiznieuski's parents. The Belarusian government threatens to criminally prosecute Belarusian volunteers as mercenaries. The KGB reportedly summons relatives of volunteers fighting for Ukraine for questioning. “Do you understand that people go there to kill and then return and live among us?”, Chairman of the Belarusian KGB Valiery Vakulchyk told the media in June 2015. He said that these people should face the consequences of their actions, sooner or later. At the same time, no criminal cases have been initiated to date, possibly because all the volunteers have remained in Ukraine. Just a year ago, the Ukrainian authorities welcomed foreigners willing to fight for Ukraine. Today, they view Belarusian volunteers as a liability rather than an asset. The volunteers deserve more respect than the Ukrainian authorities give them.